Calls NEM 45 Jan o8 is Up another 80% today. "8:35AM Newmont Mining beats by $0.47, beats on revs (NEM) 46.44 : Reports Q3 (Sep) earnings from continuing operations of $0.72 per share, $0.47 better than the Reuters Estimates consensus of $0.25; revenues rose 49.4% year/year to $1.65 bln vs the $1.41 bln consensus. Co is narrowing outlook for equity gold sales to between 5.2 and 5.4 million ounces at costs applicable to sales of between $400 and $430 per ounce for 2007. " "APNewmont Mining 3Q Earnings Double"
Slowly but surely Avino is moving close to 43-101 resource estimate. Two drills now are working on San Gonzalo deposit on Avino's Durango Mexico Property. Market Cap of the company now representing ONLY the value of production assets without any credit for mineral resources. It looks like a real bargain at this level: stock is totally forgotten and is bottoming out at double bottom. Google GOOG Earnings: Growth rate slowed further Valuation is Insane. Google managed again to get amusement of the crowd by beating expectations, but the truth is that from now on the higher it goes the harder will it fall. "International Revenues - Revenues from outside of the United States totaled $2.03 billion, representing 48% of total revenues in the third quarter of 2007, compared to 44% in the third quarter of 2006 and 48% in the second quarter of 2007. Had foreign exchange rates remained constant from the second quarter of 2007 through the third quarter of 2007, our revenues in the third quarter of 2007 would have been $24 million lower. Had foreign exchange rates remained constant from the third quarter of 2006 through the third quarter of 2007, our revenues in the third quarter of 2007 would have been $121 million lower." Net Income margin is slightly higher at 25% of Revenue vs 24% in Q2 and lower then 27% in Q1. Google managed to increase its Free Cash Flow to 1.1 billion USD from 0.7 billion in Q2, but it was "spiced" by reduced CAPEX to 0.55 billion from 0.58 in Q2 and 0.6 in Q3. Revenue per Head has declined to 266 000 USD from 281000 in Q2. It could be all very good news on solid company performance, but if you look at valuation at 640 stock is valued at ... 70 times Free Cash Flow (trailing). What is "normal"? - just 30-40 according to "value" analyst Henry Blodget. Even if Google will be granted 40 ratio for its market leader status its share price should be at around ... USD 367. With all risks related to recession and ongoing competition Google's new target price at 800 by 2008 year end is "only modest" 23% increase from USD650. Should the stock continue to rise on recent hype over USD650 it will be in parabolic move and I will build my put positions again. Until Google corrects to "conservative" levels of valuation, market bubble will be growing and its burst after housing crash will be remembered for years. More on Earnings to follow. 1. Major shareholders Capstone Mining CS.to 22% and Lundin Mining LUN.to LMC 19%. 2. John Wright business development: Co-founder of Pan American Silver. 3. Resources 367 Moz of Silver (including all categories plus historical). 4. Fixed cost of Silver at 3.92 USD/Oz. 5. Based on 2011 production 98% discount to Silver Wheaton valuation. 1. New deal on Silver Revenue Stream. Today's Capstone Mining Cozamin : Capstone Increases Resources to 8.6 Million Tonnes at the Cozamin Mine. "- The resource update yields a 47% increase in tonnage with a 51% increase in contained copper and 54% in contained silver." Google WEB 2.0 Bubble: Value Click - not so much value left. Stock VCLK is down 10% now. Is it company specific problems or Sub prime mess made its way in online advertisement market already? "The company now expects quarterly sales between $156 million and $157 million, compared with previous guidance of between $155 million and $165 million. Analysts polled by Thomson Financial expect sales of $159 million. Revenue was hurt by continued weakness in lead generation, which is the process of collecting contact information and potential sales leads, offset by better-than-expected results in the comparison-shopping segment." 1. Falling US Dollar and rising Gold price. 2. Consolidation: Majors are starving without reserves. You can find on this blog why exploration trends will make Juniors are most valuable assets in this Bull Market. 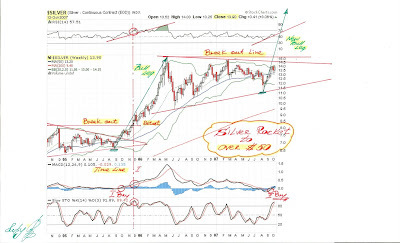 Please mention delay in Silver break out at phase I regarding to Gold break out charts on previous post. Google GOOG, WEB 2.0 Bubble, Gold and meditation on emothions and when to quit. CS. You have been wrong on GOOG for the past 500 points. When are you going to give it up? Should it fall, taking a victory lap at this point should not be warranted." This is my response which will go right into Common Sense Secrets of Trade - CS. It is very important! For me first of all, then for those who are following. It is like in the plane with oxygen mask, same routine. You should never Marry your stock, or even worse: start to Hate one. This is the ticket in the first class to poor house. (First class is because it is very expensive). There are great businesses and not so and there are stocks and their prices: representing valuations of those businesses by Investment Crowd. Judgement of the crowd is hardly ever right: we never have all information, it is distorted by "official" figures (if you really think that there is no INFLATION - save your time), Bubble Media and specially blessed people like Mad Guy. My business is to find those that are having very low valuation and those that are having very high one. Then you can build your case and invest accordingly: accumulate for your Core positions (90%) undervalued assets with IHPV (Insainly High Potential Value) which are in multi year bull market (Gold, Silver and Commodities) and maybe trade with LIMITED possible loss (puts) those that are at the peak of their performance (Google, as you know, I have allocated to this kind of stock). Why should I give up? It is not a competition, it is my observation and opinion. I am putting some money in this particular play: only what I can afford to lose, read CS if you really care. I have made some money on my puts and lost some, more on this particular trade. But my personal record does not affecting Google valuation in any way. The main factor is that we are now in late stage of a Bubble: the higher it goes the harder will it fall. Now the stock is in parabolic rise without any fundamental reason. It is madness and insanity of investment crowd that brought stock to that level. Company is "great" (remember Enron - it was also great until CEO quit in August and Enron busted in November. So far we had "only" CFO "Retired" rather suddenly) - valuation of that company is crazy and unsustainable, guys (Larry and Sergey) must be praying that it will stop rising so fast: nothing in the world could stop fear when confidence is lost. It will bring company down with its stock. Fear is more powerful feeling than even greed. Regarding my personal record I am making very good money in my core positions, did very good with puts in August on Tec, Home builders, QQQQ, DIA and SPY and closer to make money on WEB Bubble 2.0 as never. Sold out puts and bought calls on NEM, RGLD and SLW - all was posted here. Calls on NEM, SLW and RGLD are above plus 100% mark and I took some profit already. I was able to accumulate, when there was "blood on the streets" in Junior mining sector in August and I was blessed to reach my goal for this year now and standing at all time high. The goal was very high and I thought that I can not make it, but with the help of this exercise I made it. This is the reason why I am taking your question so seriously. I will do my homework in order to defend my achievement for this year at least and preserve my capital. The main point is not to lose money. 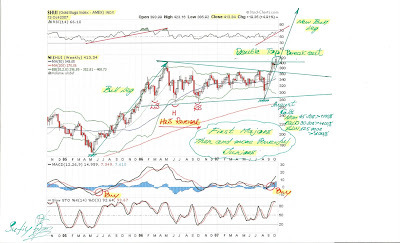 If you made some in Google, great - take profit and find new Real Bull Market within Trade of this Decade, read CS, Gold and Silver on this blog. Mission of this blog is to help you to think and do not chase last 20% of the Bubble, but to go to there where 80% percent left. If you are not convinced - fine, do not invest in juniors, gold and silver, but just do not lose your money, leave them for your kids it will be your best investment. Like I have put before: always ask - Why? I am the one of the greediest person in the world: I need you and your money to drive the Great Bull market of the decade. You are reading it now, you will come back in one year. You will start to think, ask questions and listen. Than you will make your own decision, but it will be yours not of the Mad Guy. If we will be able to get out when only 20% will be left - you will send me Xmas card. Google GOOG is loosing its steam: First CFO abrupt departure, now "golden boy"
What do they know that Market crowd can not get yet? Are Google's days over? Stock has entered WaterFall zone after Baidu.com BIDU expectation was lowered at JP Morgan. Google will turn on a dime now after parabolic rise into crash. Apparently upside of 20% from here is not worth the risk for them. "Benjamin "bling" Ling, described as one of "Larry and Sergey's golden boys," is jumping to Facebook, reports Josh Quittner at Netly News. Ling will reportedly head the white-hot Facebook platform program, having previously succeeded with Google Checkout. Quittner says Google's stunning $600-plus stock price has backfired on the company, making it profitable for top staff to bail out now rather than waiting for more shares to vest." Rather busy conference call: few analysts and investment companies engaged, swiss UBS and Julius Baer are following the story. Main message apart from acquisitions Lundin Mining is dynamic organic growth story as well. Tenke Fungurume is on track to production in 2008 and Ozernoe feasibility study is moving forward. "This indicates to us that we're moving towards a new center of mineralization and presents distinct possibilities for additional copper resources," Neil O'Brien, Lundin's vice-president of exploration and business development, said on a conference call. He said zinc drilling results at the mine were exceeding the company's expectations in terms of thickness of mineralization. "We can tell you that what we are looking at... is one of the largest known undeveloped zinc resources anywhere," he said. Lundin Mining Reports More High Grade Drill Results From Lombador Exploration. "VANCOUVER, BRITISH COLUMBIA--(MARKET WIRE)--Oct 11, 2007 -- Lundin Mining Corporation ("Lundin Mining" or the "Company") (Toronto:LUN.TO - News)(NYSE:LMC - News)(OMX: LUMI) is pleased to announce additional drilling results from the Lombador zinc zone at the Neves-Corvo mine." "CALGARY, AB--(MARKET WIRE)--Oct 11, 2007 -- Copper Fox Metals Inc. ("Copper Fox" or the "Company") (CDNX:CUU.V - News) is pleased to announce that it has delivered notice to Teck Cominco Limited ("Teck Cominco") that it has surpassed the $15,000,000 threshold of qualifying expenditures in the world class mineral deposit located at Schaft Creek, British Columbia. Under the terms of the Option Agreement of the Schaft Creek Mineral Deposit ("the Option") dated January 1, 2002 between Teck Cominco and the Company, upon incurring $15 million in qualifying expenditures Copper Fox shall earn a 70% direct interest in the project from Teck Cominco. "This is the most significant milestone to date for Copper Fox," says Guillermo Salazar President and CEO of Copper Fox. Mr. Salazar goes on to say, "The Company expects to release a scoping study in October which will represent its first economic analysis on the Schaft Creek deposit. The company is fast tracking the mine plan development processes and remains on target to achieve its primary goal of completing a bankable economic feasibility report." "Lundin Mining Conference Call to Discuss Neves-Corvo and Zinkgruvan Expansion Plans"
I am looking forward to find out how much Silver will be sold to Silverstone Resources now with Expansion plans. With this addition SST.v valuation will be even more favorable compare to Silver Wheaton SLW. You still can buy "New" Silver Wheaton at 2 CAD and a change, not for a long thou. Tgt Raised To C$16.75 From C$14.60 At Paradigm >LMC "
These guys know what they are talkimg about, they were ones who followed Tenke mining and issued BUY at CAD5.0. They also participated in PP in Tenke mining at early stage. Google GOOG market cap is more then 200 billion dollars now. Or I must refrase it "Google market cap is more then 200 billion dollars - not for long!"? If you were the owner of all Google's shares: would you keep Google or take Cash? What would you do with your cash? "I would take cash: for 110 billion I will buy All gold mining companies in HUI index, then I will buy Lundin Mining - 5.5 billion, 50 billion for Oil&gas companies in Canada, Brasil, Russia and China; for 20 billion I will become King of Junior mining sector and will buy All promising deposits in Gold/Silver/Copper/Zinc/Lead/Nickel/Uranuim and will put 10 billion to short Google over 600. I will keep 4.5 billion in mix CAD/AUD/Euro in order not to think about my investments for 25 years. In 10 years I will buy for 100 million spin off from XinHua Agency former Google just to keep my blog ranking No 1 in WEB 2.0 Bubble search"
It is very simple, but powerful approach to see behind the trees. Very much Warren Buffett style: will you buy not stock, but business at this valuation or you would rather sell? With economy going into recession, housing slump and credit crunch how will Google survive this valuation? Margins are falling, growth is slowing from the beginning of this year and market is full of rumours about disaster (be careful with this one it is too ground breaking)? This is total insanity - stock price is pump out and earnings are almost irrelevant: who will care even if Google will miss again and growth will slow further? Now everybody is waiting for Gphone...and we have new target price of 745 to chase another 25% for the crowd amusement. This company has not produced anything meaningful revenue wise apart from search so far, why it will be different this time? How will we remember these days in 25 years time? Old Wise Guy Once sad: "Five most dangerous words in investing: It Is Different This Time" The more illusion is going on the harder fall will be, when crowd will through into the towel and not only stock price but shire existence of this company could be threatened. Crowd needs affirmation as usual and this one is coming from the right source: world biggest wealth management company, please be assured their clients were busy buying for months now. "LONDON (Thomson Financial) - UBS has upgraded its gold price forecasts for 2008 and 2009 due to the changing macroeconomic outlook, on top of growing evidence the jewellery market adapted to higher prices. The investment bank has increased its 2008 forecast to 760 usd per ounce from 650 usd, while they now expect bullion to average 700 usd per ounce in 2009 versus a previous forecast of 550 usd. The potential for further weakness in the US dollar, which has recently fallen to a series of all-time lows against the euro, and the ongoing economic uncertainty stemming from the US sub-prime crisis has led UBS analysts to predict gold prices will now be stronger over the next two years than anticipated. "The past twelve months has seen strong jewellery demand growth despite higher prices," said John Reade, UBS metals analyst. "Potential for a weaker US dollar, concerns about the credit crunch and the impressive rally have brought investors back to gold in ways not seen for years, or in the case of safe haven buying, decades." When Lundin Mining took over Tenke Mining estimated long term price for copper in Tenke Fungurume Project was ... USD 1.0. There is a lot political risk, but I do not think that we will see copper at 1.0 USD for 1 lb again. "Copper specialists Bloomsbury Mineral Economics believe that we can expect copper prices to reach $9,000 a tonne within the next two years. In a presentation at Mining Journal's 20:20 Copper Day in London, Chris Welch of copper specialist analytical service, Bloomsbury Mineral Economics (BME), made a strong case for copper reaching $9,000 a tonne - $4.08 a pound - by 2009. Given that BME has a great track record on copper price predictions such a prediction should not be taken lightly! The point perhaps that both speakers were making is that individual corporate presentations of copper mine supply are frequently heavily overestimated but many analysts may take these as reality without applying a big enough discount for projects which are cancelled, fall behind schedule or for major supply disruptions for technical, political and labour reasons. Real growth in copper consumption remains very strong, older mines are becoming depleted and grades are declining sharply. Another interesting point which arose in Longley's presentation was the rate of copper usage per capita in the Asian sector in particular. It was pointed out that growth in Taiwan and South Korea has been very high in relation to the developed nations where the curve was lower because of the existing copper based infrastructure. 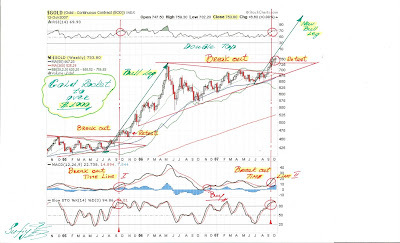 But in the real growth economies like China and India, this growth pattern has hardly started yet, and should this rise to Korean or Taiwanese levels then the effect on the$ supply/demand pattern could enormous with price development which could make $9,000 copper itself a huge underestimate!" If somebody was really interested to make a bid - it is right time: once uncertainty in DR Congo will be resolved stock will surpass CAD 20.0 and bid will have to be in CAD 30.0 region to be successful. With portfolio of Zinc, Copper, Lead and Nickel company is becoming very attractive target for acquisition. One of the suitors could be Freport-McMoRan with its pile of cash 2.0 bil USD and two J/V with Lundin Group: one in DR Congo - Tenke Fungurume and another one is Fortress Mining in Russia, which took off today to +20%? Is something going on? "Desjardins' take over price of CAD 25.00 for Lundin Mining based on Spring aquisitions value looks like a dream now, but time is flying fast and such bargains are not forever." Oct. 5 (Bloomberg) -- Lundin Mining Corp., based in Canada, will expand two mines in Portugal and Sweden to help double zinc production and boost output of lead. Do you remember who is one of the largest shareholders in CitiBank? Saudis has bought 30% more gold in second Q 2007 alone. Citi is/was part of the Anti-Gold Cartel. In this report they predict $1000 gold and acknowledge that central bank sales have been used to cap the gold price. THESE GUYS ARE THE ONES WHO HAVE BEEN DOING THE SHORT SELLING ON BEHALF OF THE CENTRAL BANKS. Clearly they have broken ranks. This is an incredible development. Must be some serious news are coming...Lundin Mining LMC LUN.to owns 10% of the company. "Vietnam is planning to cut its purchases of US Treasuries and other dollar bonds, raising fears that Asian central banks with control over two thirds of the world's foreign reserves may soon join the flight from US assets. Separately, the gas-rich Gulf state of Qatar announced that it had cut the dollar holdings of its $50bn sovereign wealth fund from 99pc to 40pc, switching into investments in China, Japan, and emerging Asia." It is very positive development for the company. Now institutional investors could buy this stocks and Toronto Exchange is providing much more credibility then OTC market. "WALLACE, IDAHO--(MARKET WIRE)--Oct 2, 2007 -- Sterling Mining Company (Toronto:SMQ.TO - News)(OTC BB:SRLM.OB - News)(Frankfurt:SMX.F - News) announces that further to the completion of conditional approval of the Toronto Stock Exchange ("TSX") to list its common shares (see press release dated September 28), the common shares of Sterling have now commenced trading on the TSX under the symbol "SMQ"."